Fire Ball is a ball-shaped fire extinguisher. 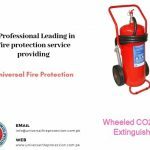 Simply thrown into a fire, it will activate within 3 to 5 second or more and effectively disperse-extinguishing chemicals. When a fire occurs and no one is present, Fire Extinguishing Ball will self-activate when it comes into contact with fire and give a loud noise like a fire alarm. 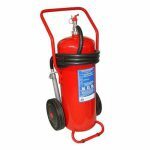 Many modern “ball” or grenade-style extinguishers are available on the market. The modern version of the ball is a hard foam shell, wrapped infuses that lead to a small black powder charge within. The ball bursts shortly after contact with flame, dispersing a cloud of ABC dry chemical powder which extinguishes the fire. The coverage area is about (54 sq ft). One benefit of this type is that it may be used for passive suppression. The ball can be placed in a fire-prone area and will deploy automatically if a fire develops, being triggered by heat. They may also be manually operated by rolling or tossing into a fire. A lot of modern extinguishers of this type are designed to make a loud noise upon deployment. Watch Demo, How to use Fire Ball Extinguisher? 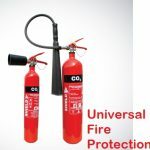 Fire Extinguisher Ball is suitable for use on normal combustibles like wood, paper, and flammable liquids. it’s the ideal fire safety product for your kitchen, car, or boat, when grilling or camping, and ideal for restaurants, offices, auto shops, and manufacturing facilities too. There is no special training or skill required to operate the ball and no need to face the dangers of the fire like in fire Extinguisher. No maintenance is required.